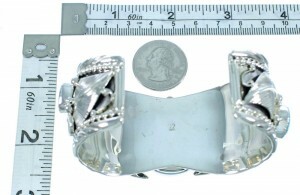 The inner bracelet circumference measures approximately 5-7/8", plus a 1-3/8" opening, and 1-3/8" at widest point. 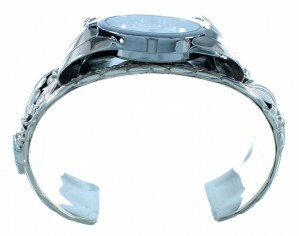 The watch weighs 90 grams. An offer like this will not last long! 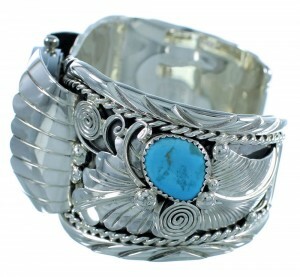 This piece of Native American jewelry is Navajo hand crafted by artist Thomas Yazzie, out of genuine sterling silver and real Turquoise stones. 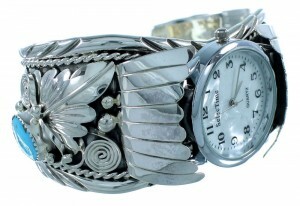 A total Of TWO stones are gently set in hand cut bezel settings while stunning silver work creates beautiful scalloped leaf designs throughout the watch. 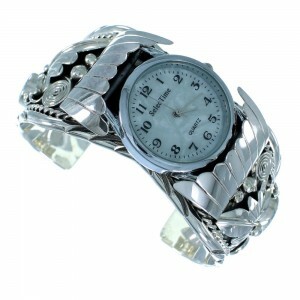 Twisted silver and imprinted designs complete the watch for a perfect finish. The watch is stamped .925 (sterling) and hallmarked.